Home / Living Pi Explaining Pi Others / THINK ZEBRA! 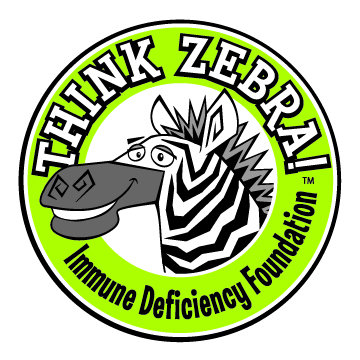 The primary immunodeficiency (PI) community often identifies with zebras. This is based on an old saying. In medical school, many doctors learn the saying, “when you hear hoof beats, think horses, not zebras” and are taught to focus on the likeliest possibilities when making a diagnosis, not the unusual ones. However, sometimes physicians need to look for a zebra. People with PI are the zebras of the medical world. So IDF says THINK ZEBRA! People with PI, along with their family and friends, can be seen wearing zebra striped clothes and using accessories adorned with black and white stripes. All ages identify with zebras, and it has been an especially good way for children with PI to describe their disease to others—they are like zebras. THINK ZEBRA! Wear your favorite zebra attire and post your photos to IDF Friends, Facebook, Twitter or Instagram! Click here to download the THINK ZEBRA! logo. A few years ago, the saying truly came to life through the official IDF mascot, TZ the IDF Zebra. The name “TZ” comes from THINK ZEBRA! TZ travels across the country to promote awareness of PI and meet fellow zebras. Children, young and old, can’t help but smile when they see TZ, serving as a reminder to members of the PI community that they are not alone and together we are #zebrastrong. Follow TZ on Twitter or Instagram.